The dividend yield now stands at 3.7%, rewarding investors who've stuck around during Big Blue's transformation. International Business Machines (NYSE:IBM) is still struggling to reach the point where its growth businesses fully offset decreases in legacy revenue. The first quarter, results for which IBM reported last week, marked the 20th consecutive quarterly revenue decline. IBM has also extended another streak, one that should make investors happy. The company announced that it was boosting its quarterly dividend payment to $1.50 per share, a 7.1% increase that brings the dividend yield up to about 3.7%. IBM has now increased its dividend annually for 22 years in a row, and it's paid a quarterly dividend uninterrupted since 1916. Even with dividend growth slowing, IBM is a solid dividend stock that just got even better. On a percentage basis, the latest dividend increase is the smallest in over a decade. IBM's earnings have declined in each of the past three years, so this shouldn't come as a surprise. The new quarterly dividend, which comes out to $6 per share annually, will eat up 43.5% of IBM's adjusted earnings in 2017, assuming the company hits its guidance. IBM expects to produce adjusted EPS of at least $13.80 this year, up slightly from 2016. The payout ratio is a bit higher if free cash flow is used instead of earnings. IBM expects its free cash flow this year to be roughly flat compared with 2016, which would put it at about $11.6 billion, excluding receivables from its financing business. Based on the current share count, IBM will pay out about $5.65 billion in dividends during 2017, just shy of half its expected free cash flow. 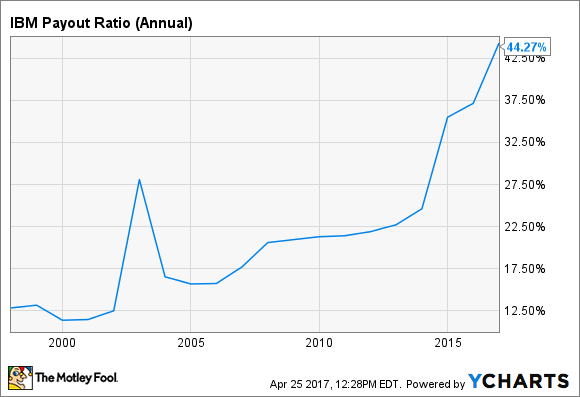 IBM's payout ratio has soared over the past 20 years, with a big jump in the past few years driven by slumping earnings. The company paid out less than 25% of its earnings to shareholders for much of the past two decades, allowing the dividend to grow faster than earnings. That will be more difficult going forward. IBM Payout Ratio (Annual) data by YCharts. Small dividend increases will likely be the norm unless IBM can return to robust earnings growth. Adjusted earnings are expected to grow slightly this year, but it will likely take a return to revenue growth for earnings to really take off. Still, with a 3.7% dividend yield, even sluggish dividend growth makes for an attractive dividend stock. Shares of IBM plunged after it missed first-quarter revenue estimates, in part due to the timing of some major service deals. The story at IBM hasn't really changed, though, and now the higher dividend makes the stock even more attractive. IBM's return to revenue growth is still pending, and investors are rightfully hesitant to invest in a company that has seen sales slump for five years running. But IBM's growth businesses are expanding at a double-digit pace. Its cloud business generated nearly $14 billion of revenue in 2016, and cloud-as-a-service is at an $8.6 billion annual run rate, up 61% over the past year. With $13.80 in adjusted EPS expected this year, IBM stock trades for less than 12 times forward earnings. That's too low, in my opinion, especially considering the 3.7% dividend yield. IBM still needs to prove that its transformation can produce sustained earnings growth, and the market is unlikely to give the company credit for its turnaround until revenue starts growing again. But if you wait for the pessimism to subside, you'll miss out on a great dividend stock selling at a discount.